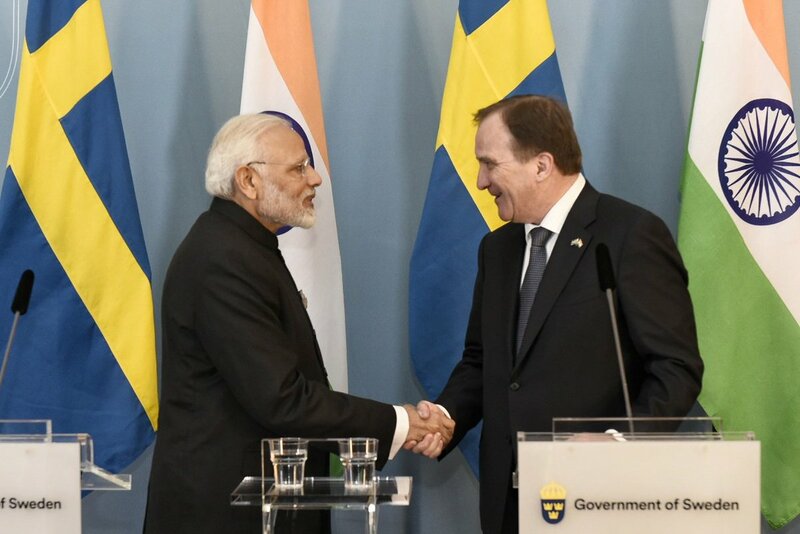 India and Sweden have agreed upon an innovation partnership and a joint action plan after delegation-level talks between Prime Minister Narendra Modi and his Swedish counterpart Stefan Lofven at Stockholm this afternoon. The Joint Action plan is aimed at enhancing bilateral cooperation in various fields including energy, clean technology and Trade. During a joint media briefing after the talks, the two leaders said, there are excellent opportunities for cooperation in the fields such as smart cities, clean technologies, renewable energy and startups. They said, these opportunities have enormous potential to create employment and sustainable development for people in India. Mr Modi said, India is focusing on issues like the urban transport and waste management which will improve quality of life. Stating that Sweden has been supporting Make in India from starting onwards, Mr Modi said, Sweden can be India’s important partner in seeking innovative solutions for the development challenges that India is facing. Swedish Prime Minister Stefan Lofven said, Sweden has kickstarted the Innovation partnership by providing 50 million Swedish crooners. Mr Lofven and Mr Modi interacted with the top Swedish Business leaders on the occasion. The interaction mainly focused on the investment opportunities in India especially infrastructure and other areas. Earlier in the day, Prime Minister Narendra Modi met King of Sweden Carl XVI Gustaf in Stockholm and interacted over boosting India -Sweden relations. The two countries agreed to deepen their collaboration in the field of innovation through the strategic partnership. Mr Modi will address India Diaspora today. After concluding his Sweden visit, Prime Minister will travel to the United Kingdom tomorrow. Mr Modi will attend the Commonwealth Heads of Government Meeting in London. He will also address a unique event ‘Bharat Ki Baat, Sabke Saath’. Trade, healthcare and technology will be high on agenda during the Prime Minister’s visit.